The school bus is rightly considered as an extended campus and DPS, Gandhinagar takes utmost care of it. The cleanliness, condition, and security of the students stays on the top of the list of the dedicated Transport Department. The drivers and conductors are well-experienced and well-groomed. The school has a rigorous procedure of inducting the bus drivers and conductors and the rules are seldom relaxed. The school follows all the Safety Guidelines issued by the Supreme Court of India and the Transport Department of the State of Gujarat. The school vehicles are kept in the best condition and undergo maintenance on a continual basis. In order to ensure safety and security of the students and also to maintain discipline and decorum, teachers accompany the students. 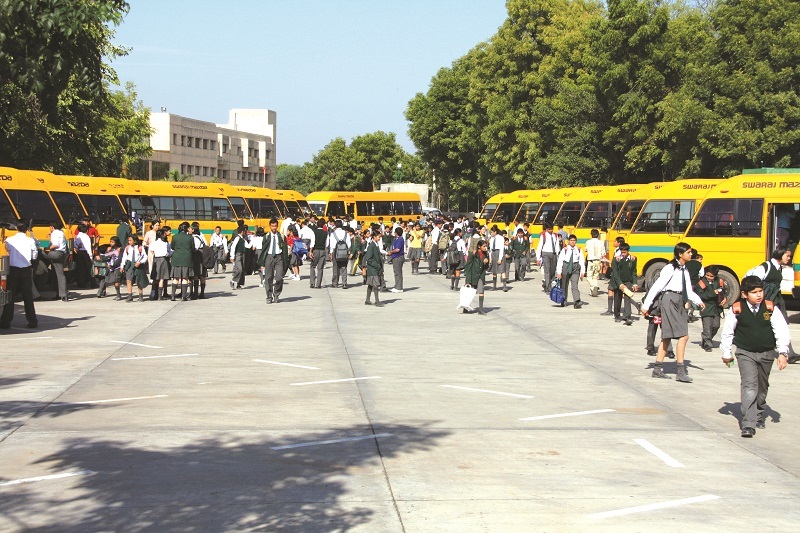 Objective:Transport service provided by DPS Gandhinagar is a facility to ensure safe commuting of students to and from school. Aim:To reach school in time in a safe and secured manner. Goal:To help in decongestion of traffic by minimizing number of vehicles on road. This will save lot of fuel, restrict growth of pollution levels and waste of precious oil. Well maintained and RTO approved buses. Experienced and trained Drivers / Conductors. Fire extinguisher in each bus. Insurance to all the children in case of any eventuality. Transport service is a facility provided by the school management and it is mandatory. Transport service will be provided till the nearest point and no door pickups and door drops will be done. Buses will not wait beyond one minute at each pick up point, to enable the bus to reach school in time. Parents must ensure that their ward is ready at the respective pick up points before time. Pick up point may be modified / withdrawn according to the convenience of the transport department. Transport service charges are not fixed and depend on the fuel price and inflation levels. Transport service charges are liable to change every six months. One way pick up or dropping is not possible. If parents wish to avail one way transport facility by paying for both sides then it may be considered based on the availability of seat in the bus. Management has and will take continuous measures to ensure safety and security of the students, However in case of any eventuality, management is not responsible for any compensation or reimbursement of medical charges beyond the amount paid by the insurance company. In case the transport facility does not suit the students and parents wish to withdraw the student from the school, management will refund only caution deposit and will not refund term fee, admission fee, annual fee or any other fees including transport fees paid. Transport will not be offered to the students beyond 30 kms from the school premises. Withdrawal of transport facility during the IV quarter is not permitted. Mobile phone is strictly prohibited for drivers during driving. Conductors will take calls in case of emergency.